If the gown of your dreams is a family bridal gown that time has yellowed and stained, call us! We specialize in restoring antique gowns and vintage bridal gowns to the true color without damage to delicate fabrics or dyes. We remove stains and discoloration that ordinary dry cleaners cannot, and our restorations have been featured on television and in publications around the world. Check out our feature in Bride & Groom Magazine’s Winter 2014 issue! Whether it is a family wedding gown or vintage veil or one of those special gowns you or someone in your family wore as a child, we can renew it for your special day. 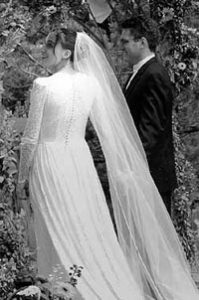 You can trust us to give your vintage wedding gown or family gown the care and attention it deserves. There is never any charge to consult with our Certified Wedding Gown Specialists™ about caring for your vintage wedding gown and other vintage clothing. They can offer you ideas for redesigning the family gown for today’s bride, suggest ways to turn your wedding gown into a christening gown, or help you with special projects such as displaying a family gown at a reception or anniversary celebration. 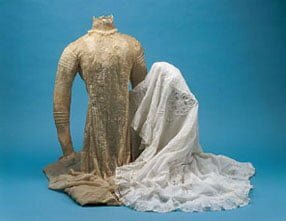 As seen in The Complete Idiot’s Guide to the Perfect Wedding: Antique wedding gown and slip, c.1900, hand-embroidered cotton and cotton lace. 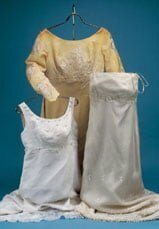 Both wedding gown and slip were badly oxidized, but the slip at right has been restored with our MuseumCare™ process. Three vintage silk organza wedding gowns from the 1980s. 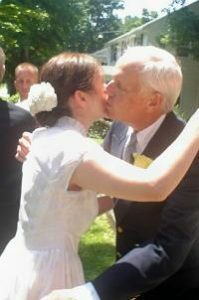 Wedding gown in the background is badly discolored due to age and improper storage. Bridal gown at lower left made from same type of fabric has been restored with our MuseumCare™ process and altered for today’s bride. Bridal gown at lower right did not need color restoration but has been restyled.